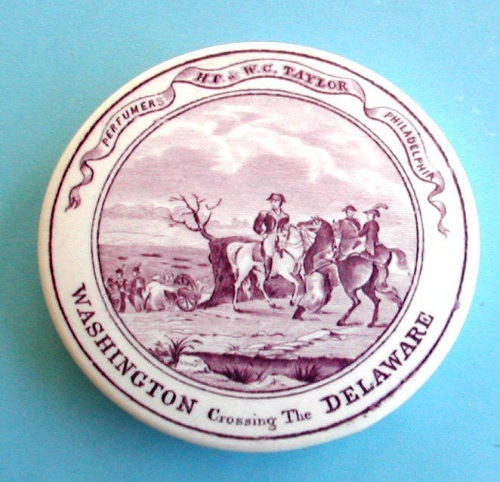 I HAVE ALWAYS LIKED POT LIDS AND NOT ONLY ARE THEY A RARE THING IN THE U.S. 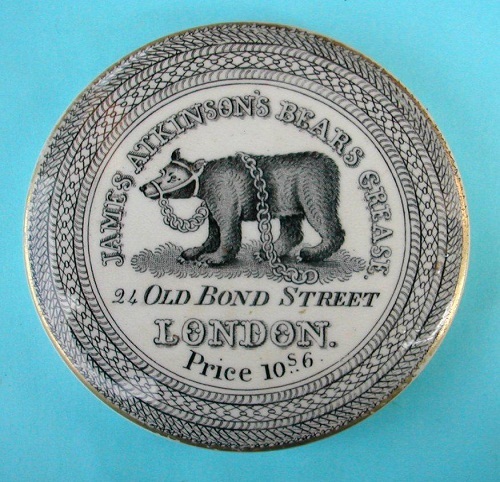 THEY ARE ALSO VERY PRICEY IN THE U.S.. i SEEN DAVID TRELOARS IMPRESSIVE COLLECTION OF LIDS AND JUST DECIDED THAT A PAGE FOR THEM WAS THE ONLY RESPECTABLE WAY TO SHOW THEM OFF. 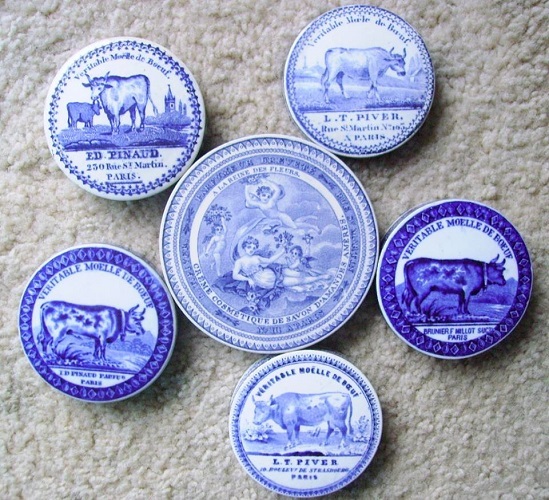 DAVID IS FROM VICTOR HARBOR, SOUTH AUSTRALIA AND BELOW IS HIS EVER CHANGING COLLECTION OF POT LIDS. 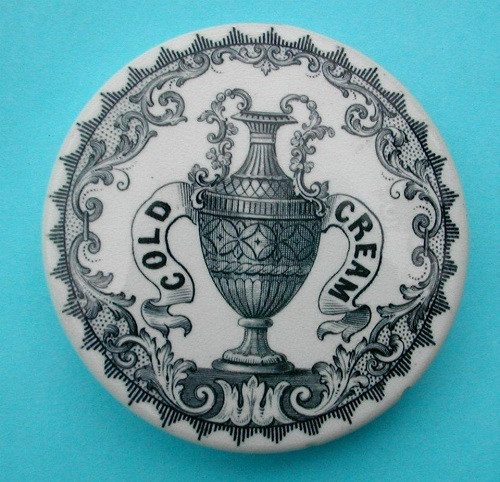 Pot lids are the covers of small pottery containers used to hold a variety of manufactured products, primarily from 1840 to 1910.They were frequently decorated by transfer-printing to describe the contents. 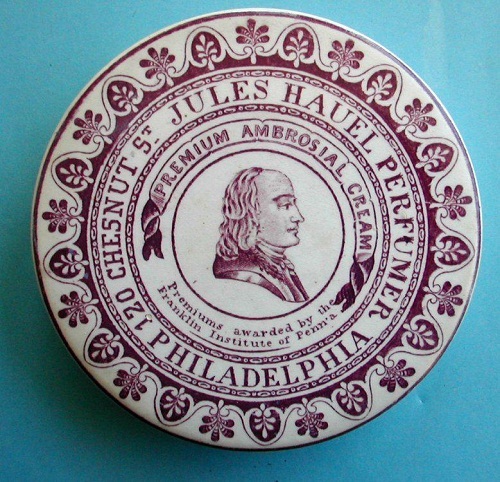 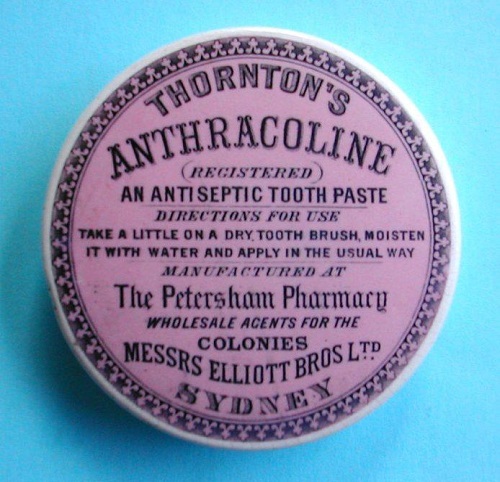 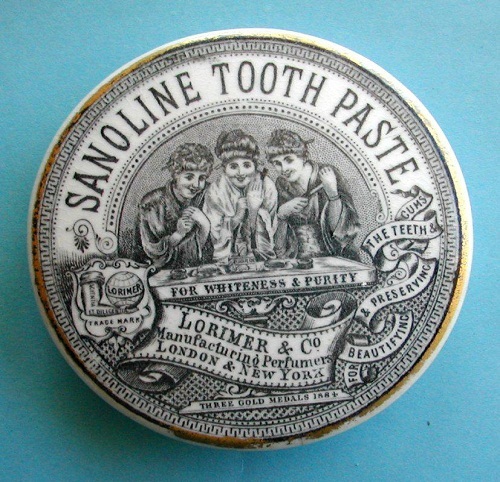 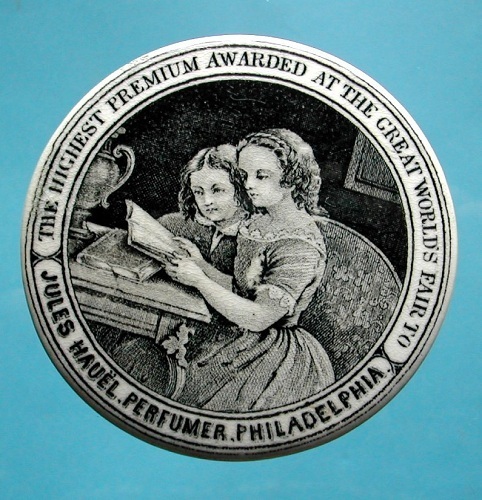 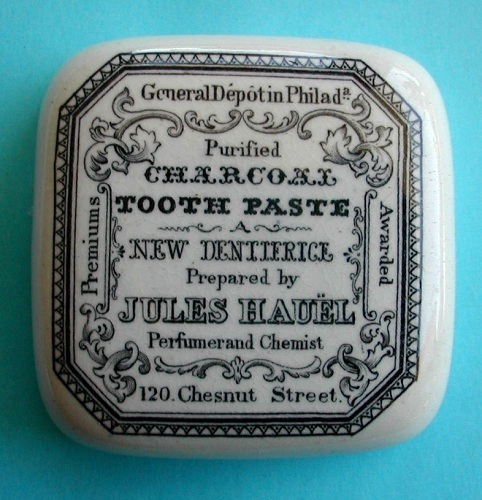 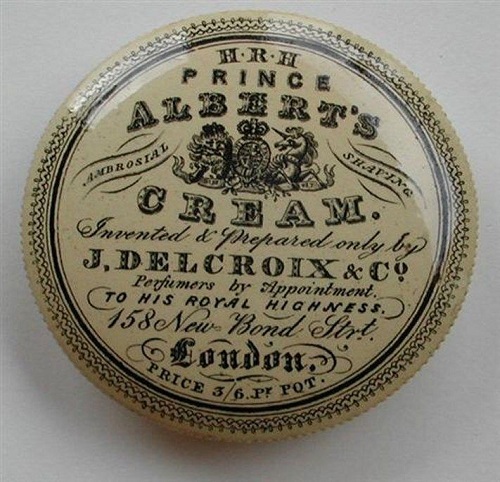 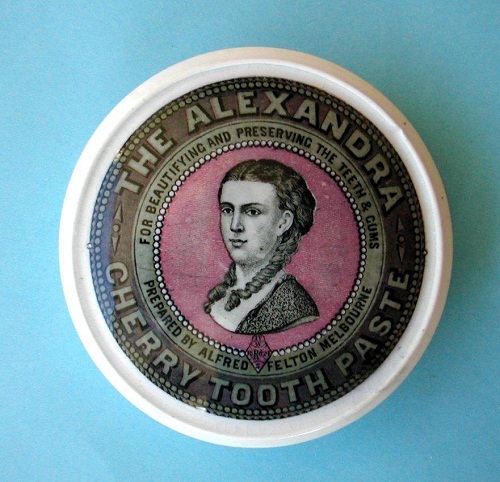 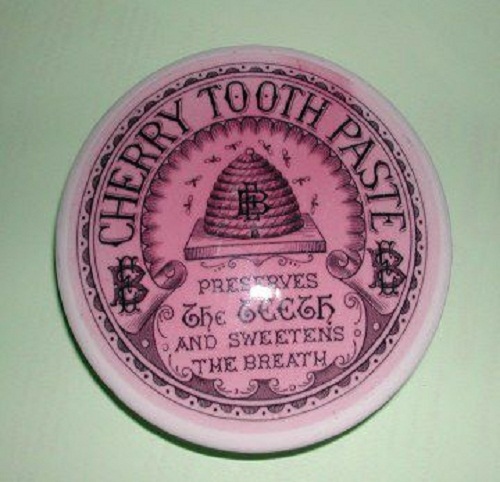 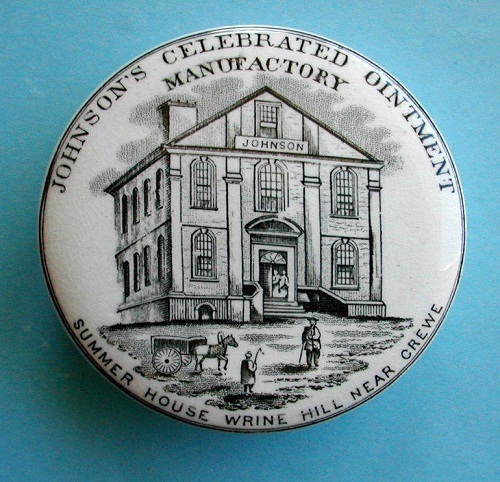 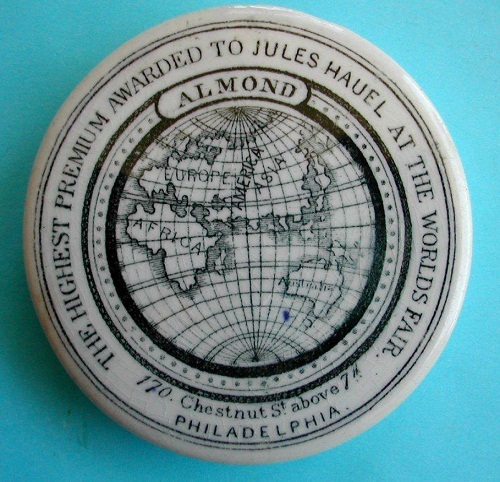 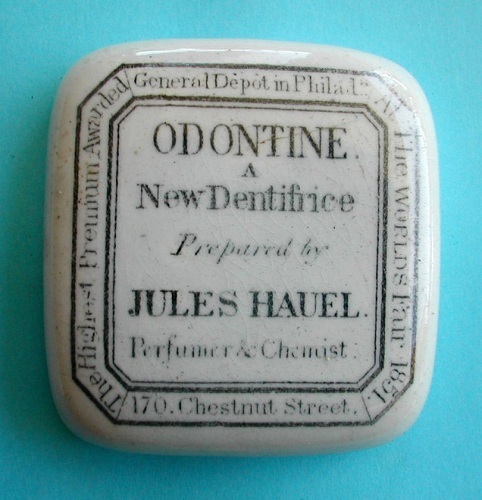 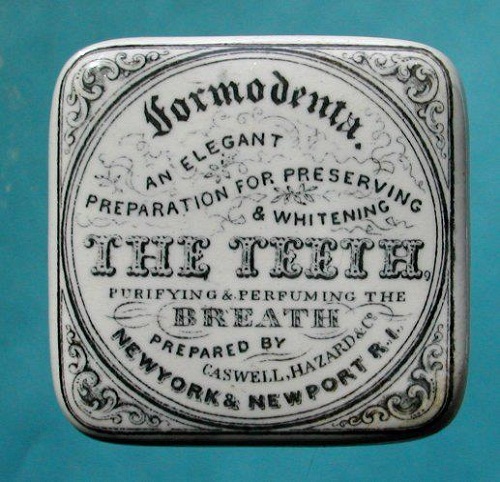 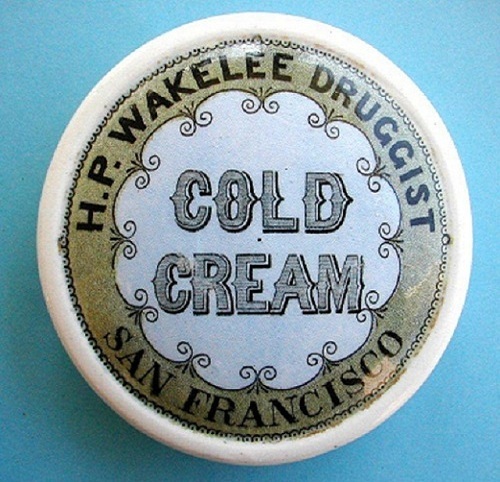 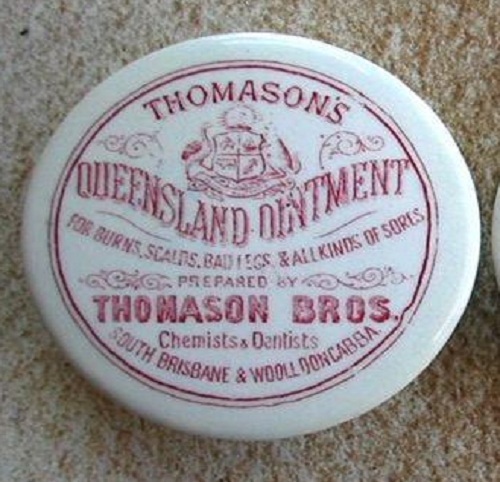 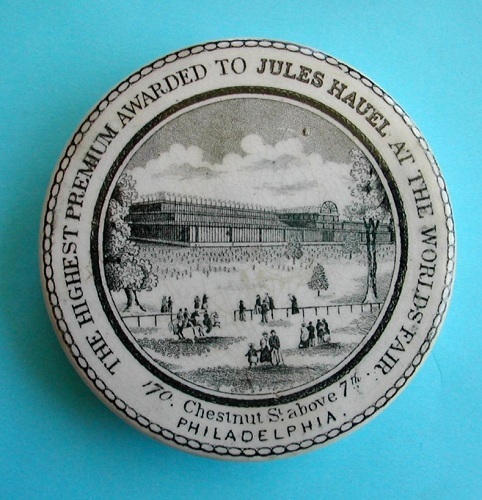 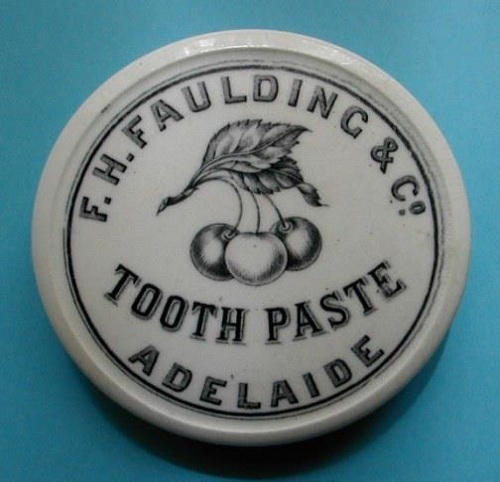 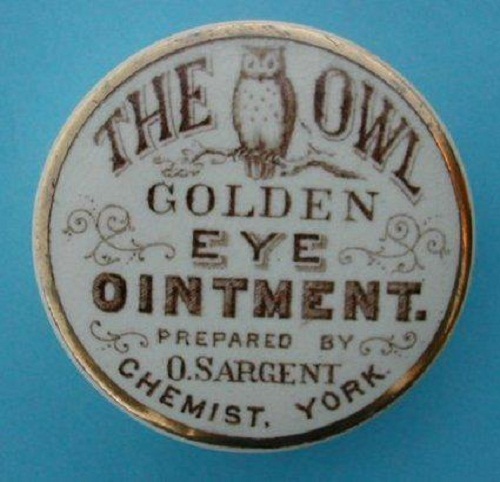 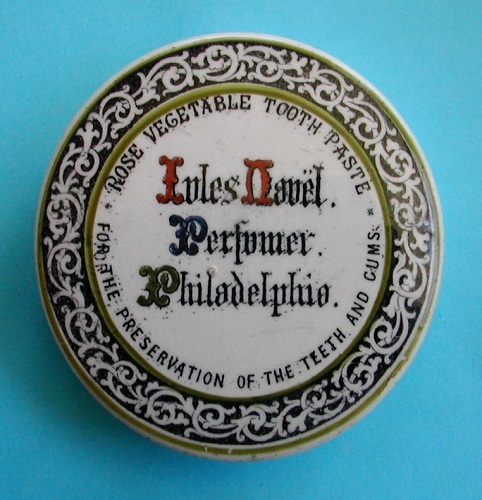 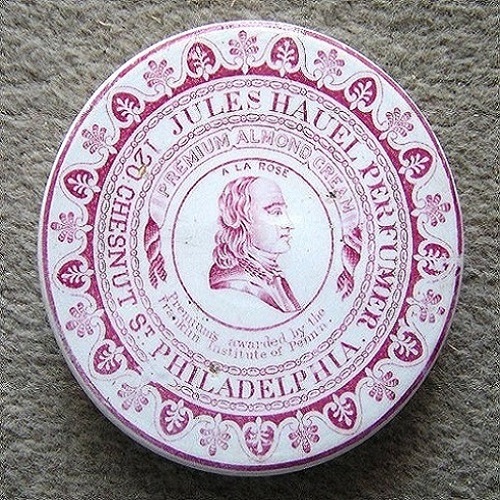 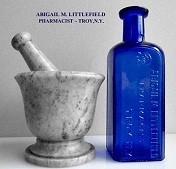 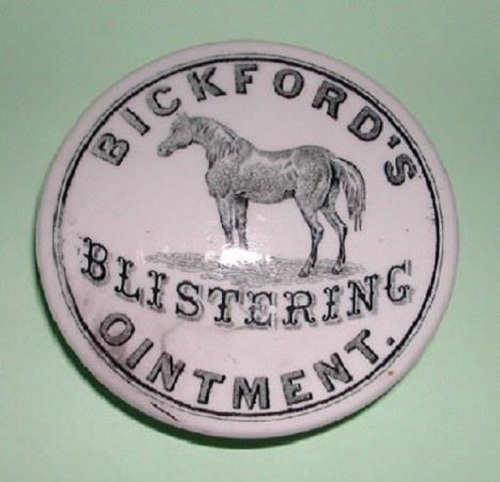 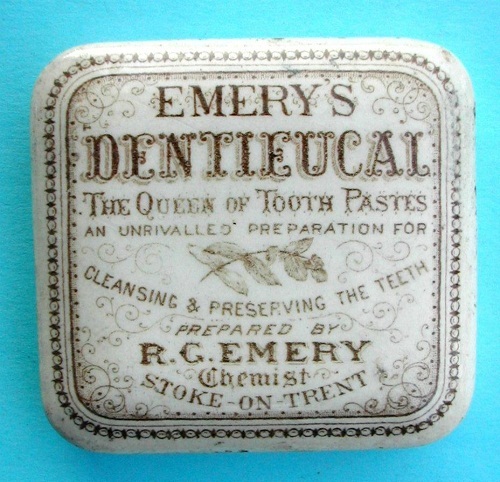 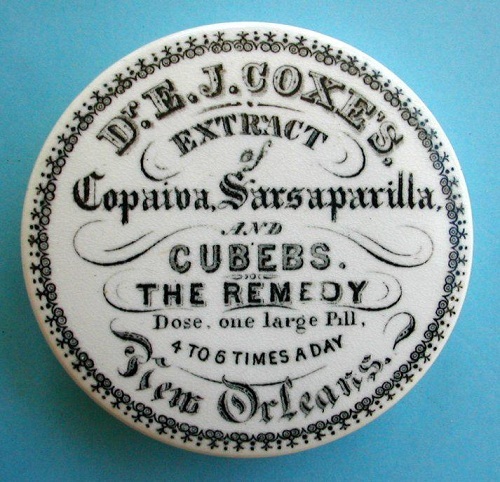 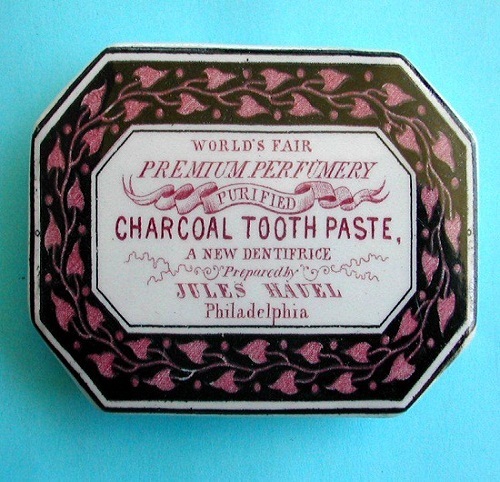 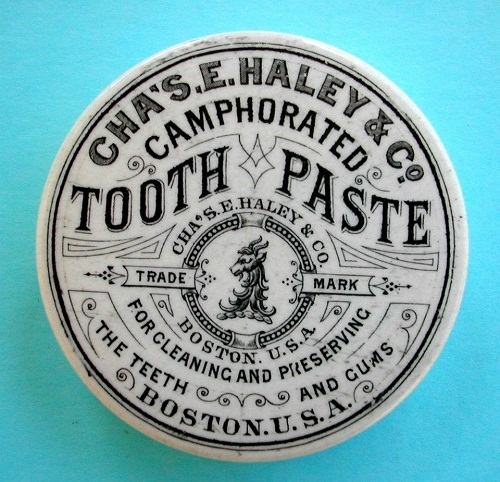 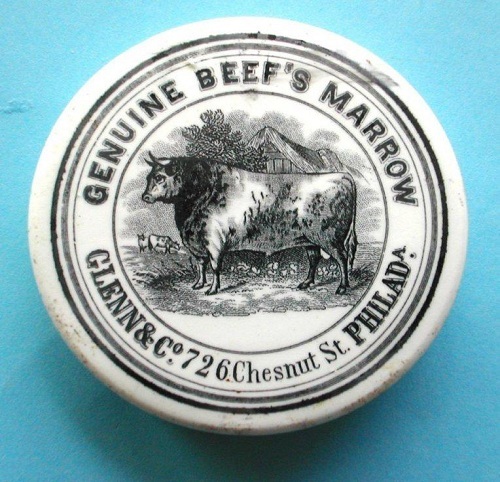 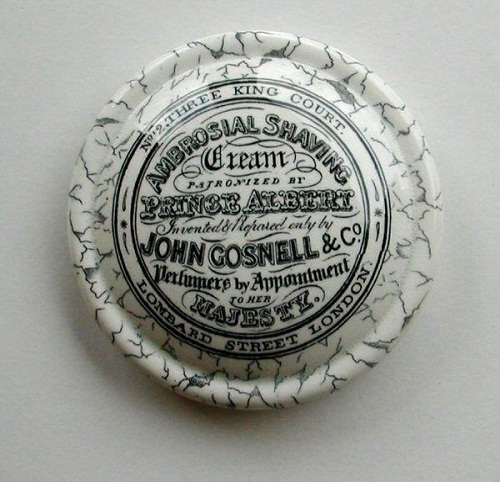 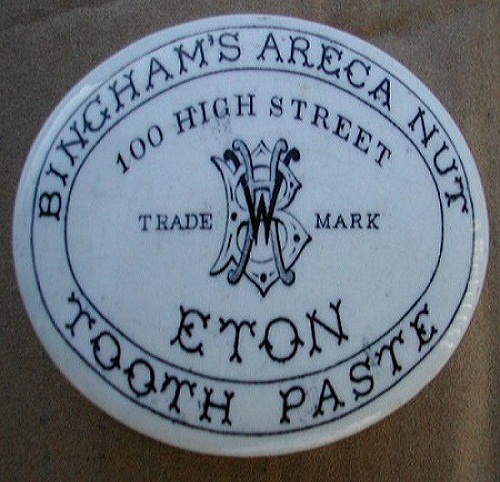 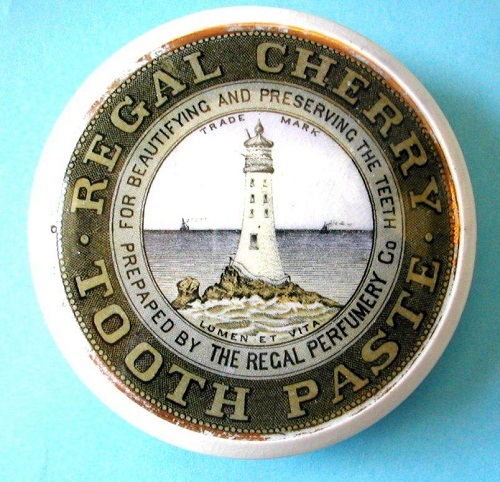 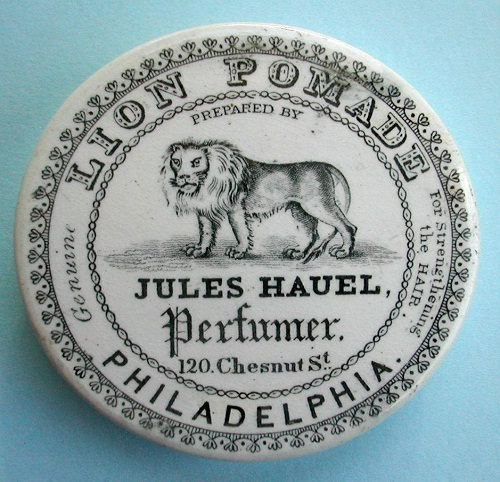 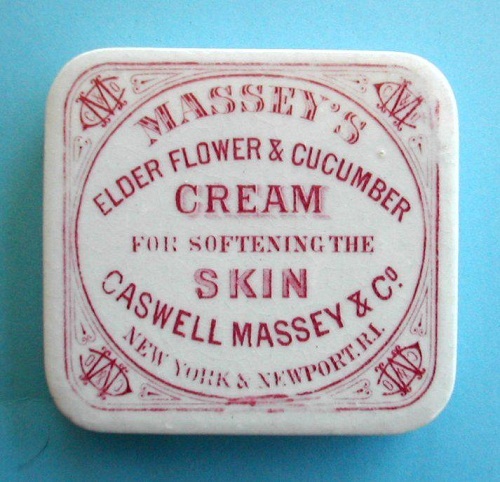 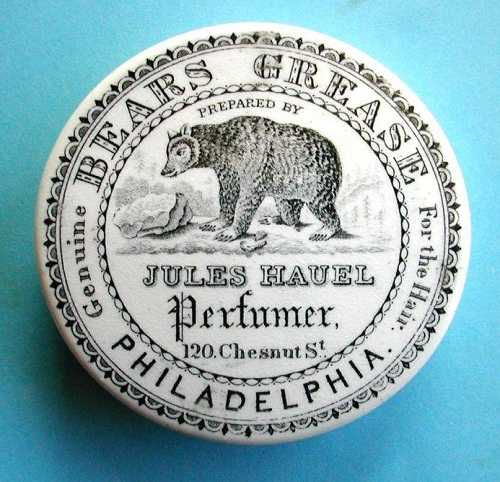 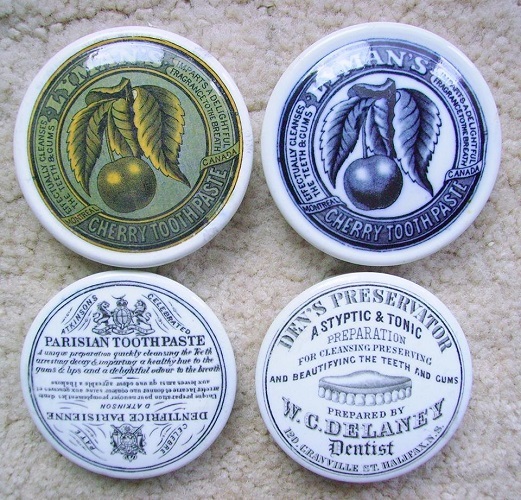 Prior to the invention of the transferprinting process, the brand names of manufactured goods were hand-lettered onto the side of the pot or described by means of a paper label pasted on the lid. 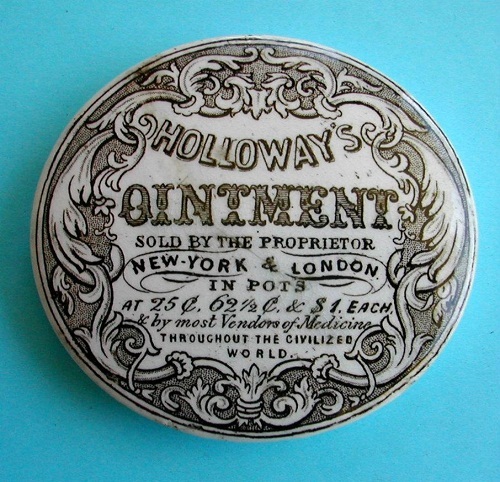 Although laborious by today’s standards, the transfer-printing process introduced a much quicker and economical method of describing the contents than did hand lettering. 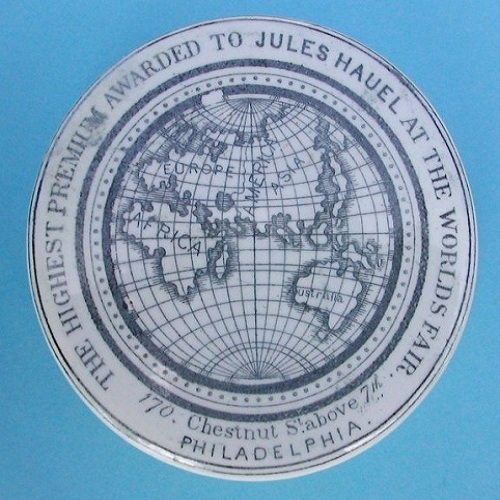 This labeling method also allowed for a greater degree of artistic expression and enticed buyers by the aesthetic appeal of the package. 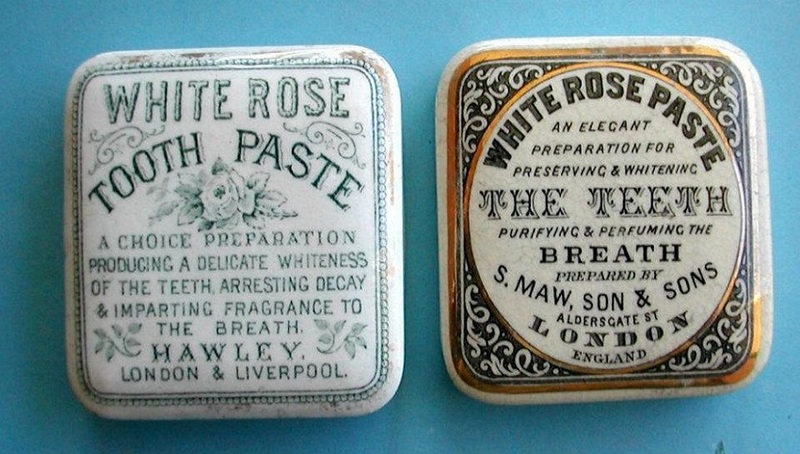 This process was distinctively English. 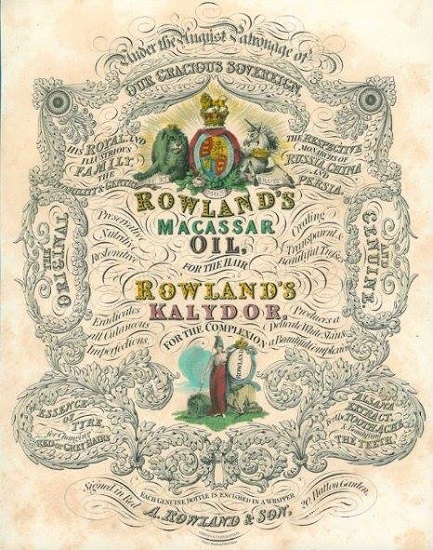 It originated in Liverpool in the second half of the eighteenth century. 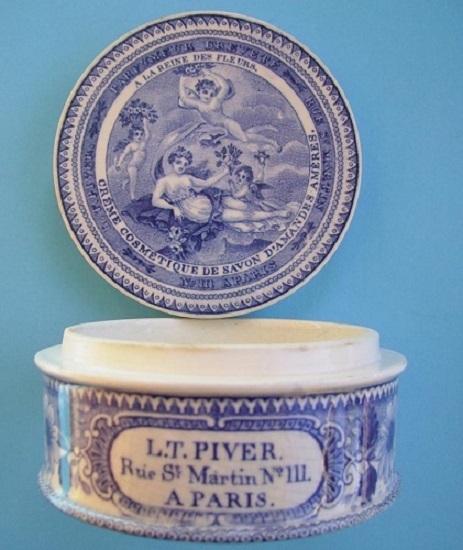 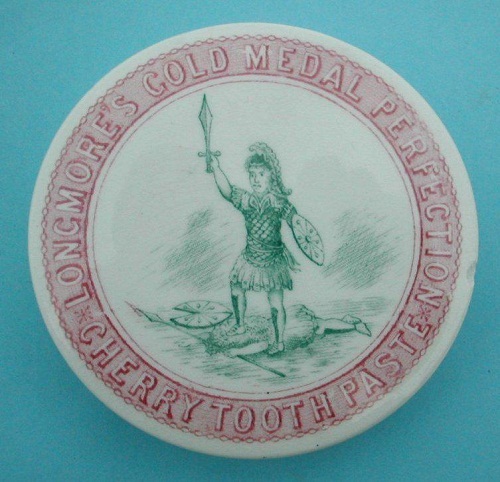 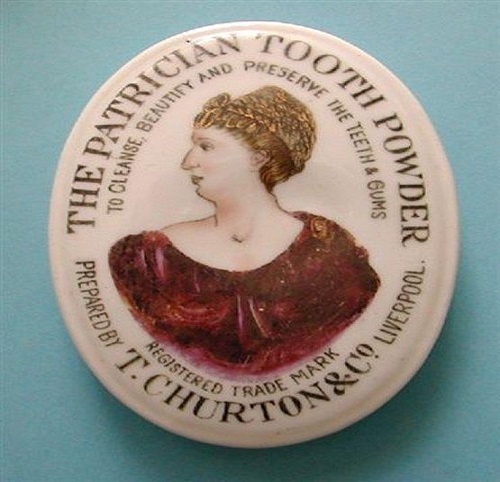 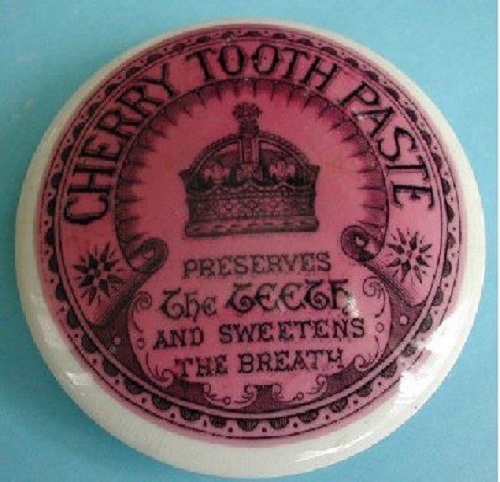 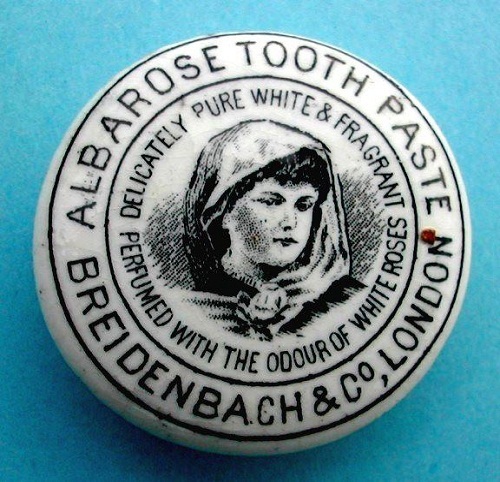 Although not in general use for packaging until the 1840s, transfer printing was used for domestic porcelain and pottery in the intervening period. 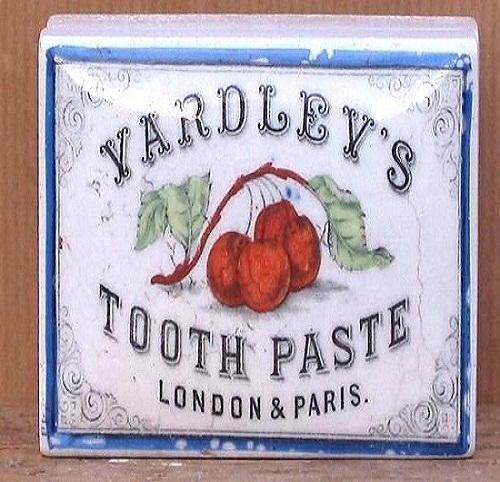 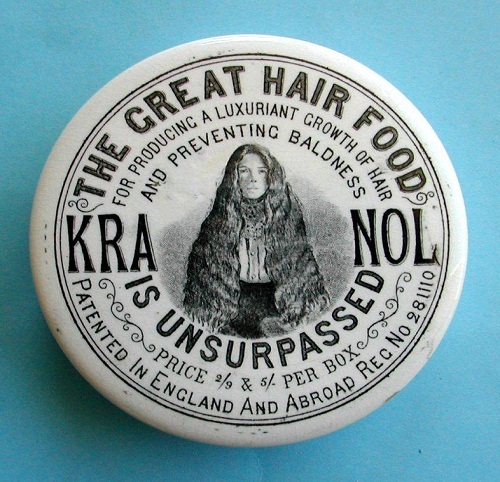 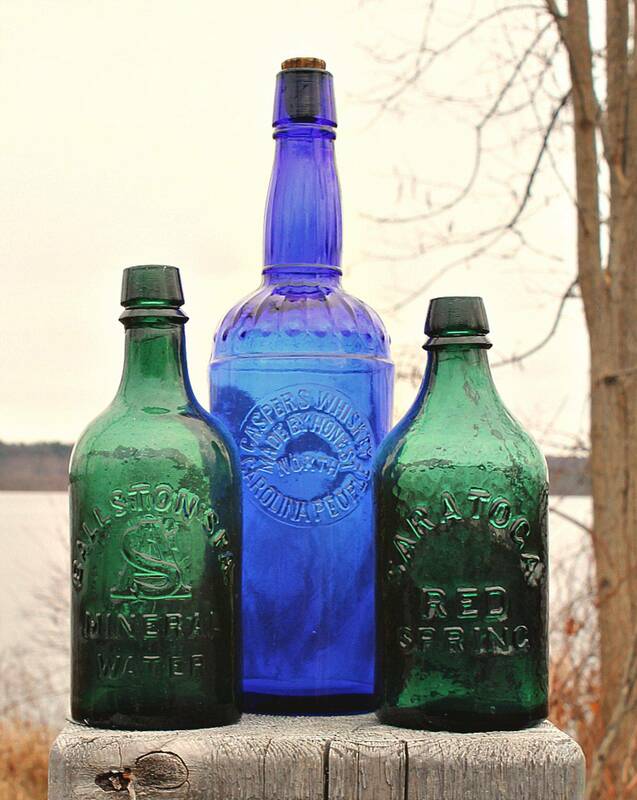 By World War I, it had been virtually eliminated by cheaper methods. 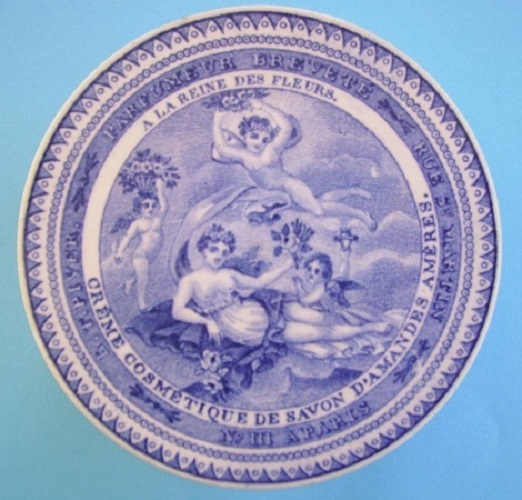 The transfer is lifted onto tissue-thin paper from an engraved copper plate that previously has been inked or colored. 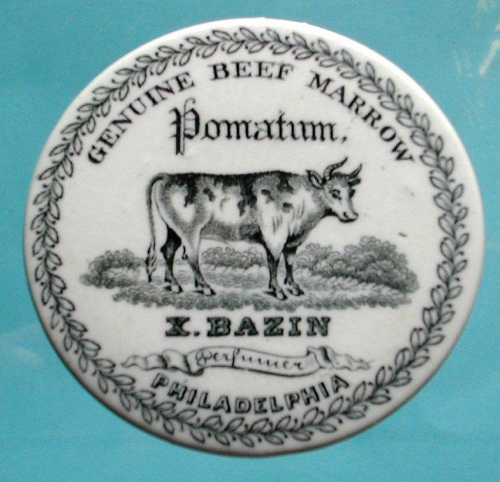 It is then transferred to the lid after the first baking (i.e., the bisque stage) and rubbed until the print firmly adheres to the pottery. 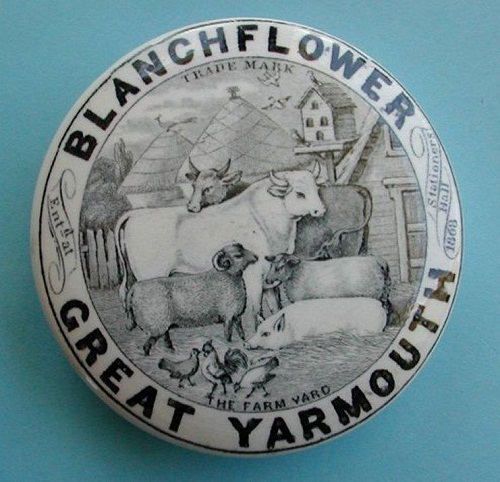 The paper is then carefully removed, usually by washing or floating it off in water and the lid glazed and fired to fix the design as an integral part of the pottery. 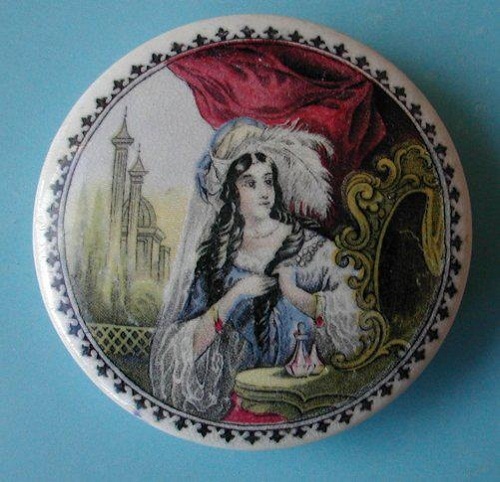 Because of the high production cost of multicolored advertising pot lids, single colored lids dominated the market. 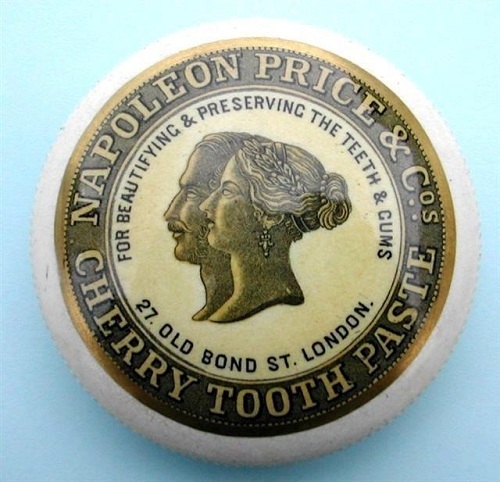 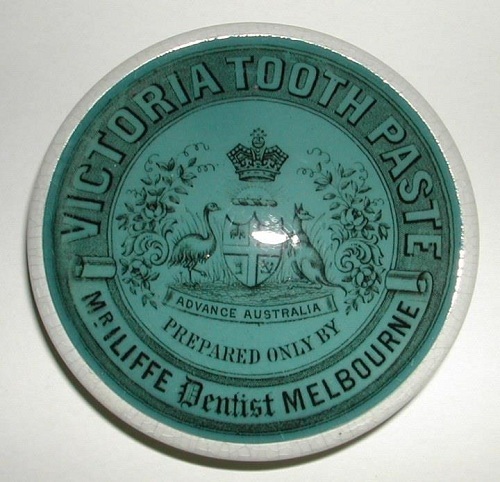 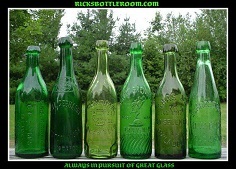 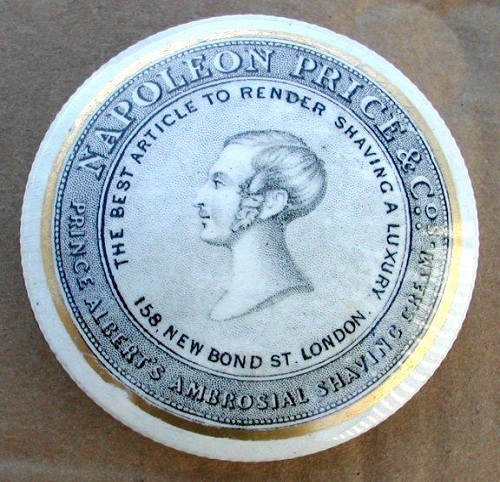 Gold bands were sometimes added around the border of the container to give the product a high-class appearance. 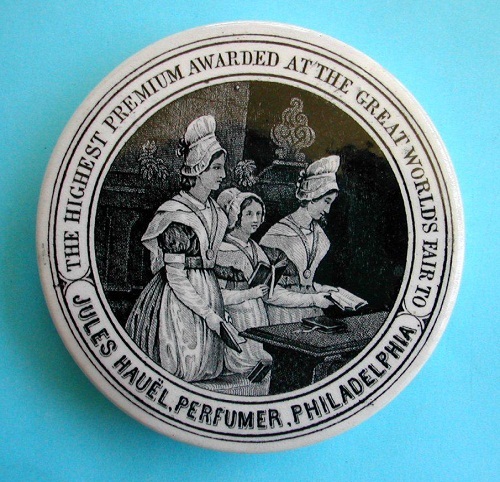 The majority of pot lids were circular. 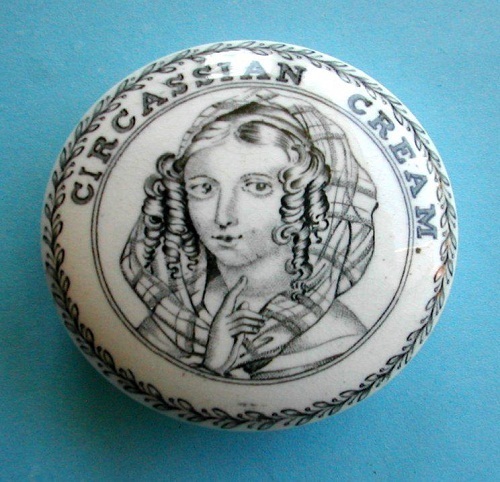 However, square, rectangular and oval examples are frequently found. 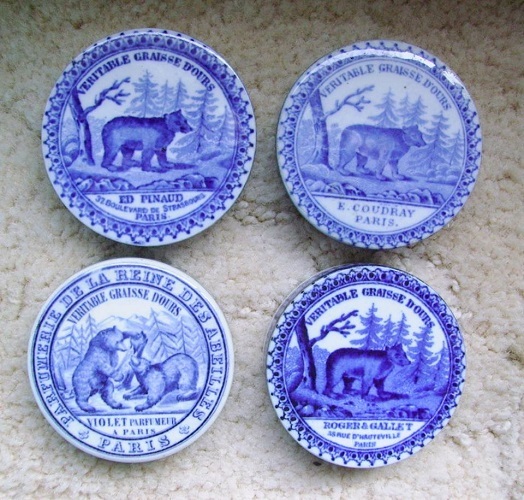 They also came in various sizes from the small sample size of less than an inch and a half in diameter to 10 inches for economy size. 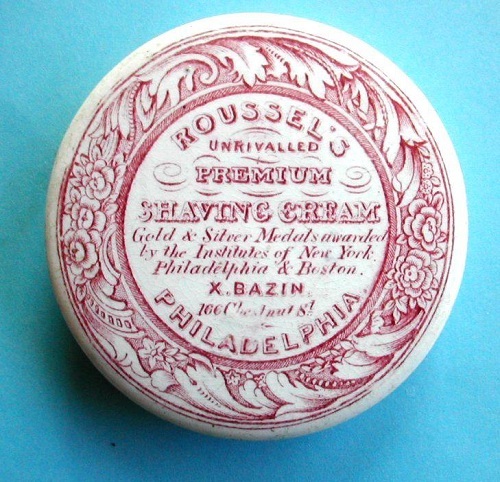 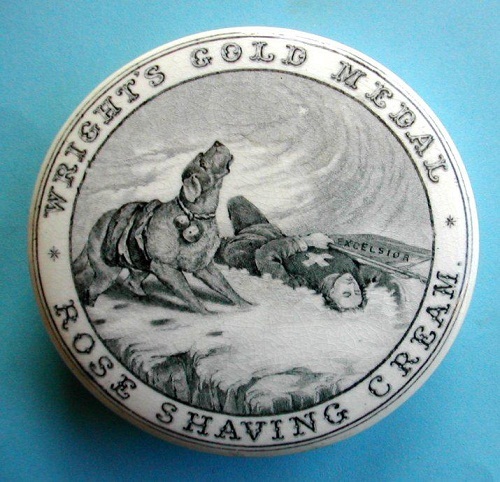 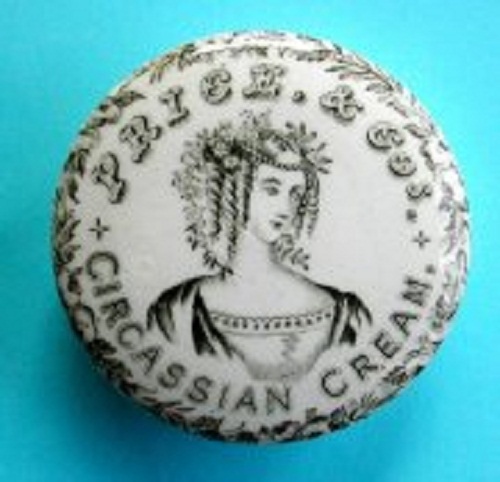 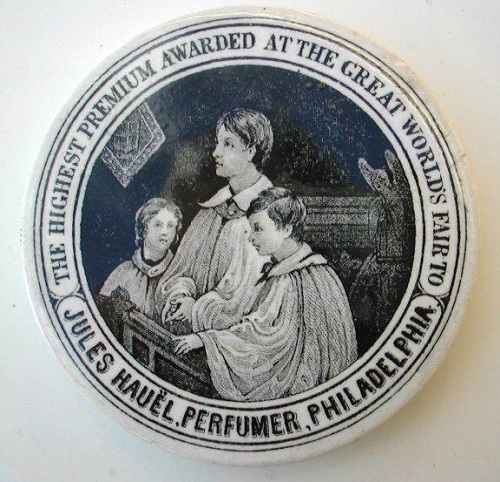 ROUSSEL'S, PREMIUM SHAVING CREAM ~ X.BAZIN, PHILA. 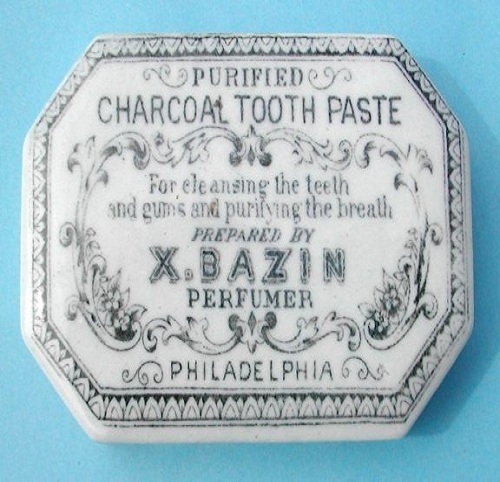 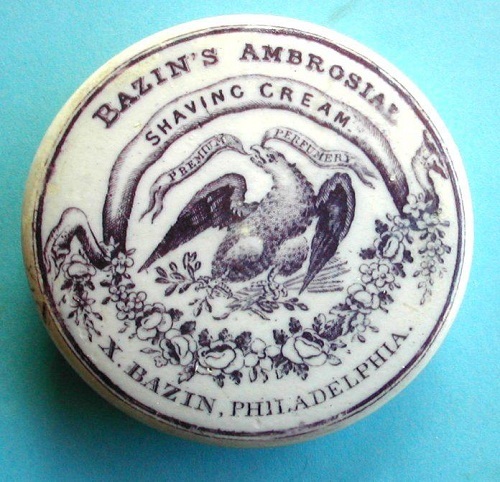 ~ X. BAZIN SAPONACEOUS SHAVING COMPOUND ~ PHILA.